Freshman Eddie Aguillar performs with the Brigade at halftime. 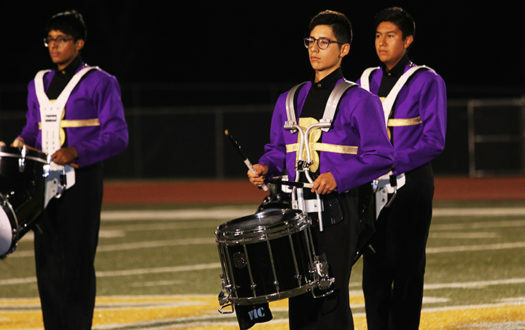 Edgar Aguilar, who prefers to be called Eddie, is a freshman who loves music. He loves to listen to music and he loves playing instruments. Eddie is a member of the Bison Brigade, and every Friday night he is out marching on the field with the rest of his band members. Apart from participating in the Bison Brigade, Eddie also participates in UIL, FCCLA and Art Club. He likes to participate in many things to keep him busy, and he works hard to keep a high A and B average in all of his classes. In Eddie’s spare time he enjoys doing anything with music. He also likes to draw, spend some time outside, or watch his favorite TV shows. Eddie has a strong and happy bond with his family. They spend time together when they can and do whatever a normal happy family would. They all love each other equally and they are thankful that they have always been there for each other. After Eddie graduates high school, he plans to make money by working and eventually go to the University of Houston to get a bachelor’s degree. He wants to get a bachelor’s degree to become an engineer in the future.